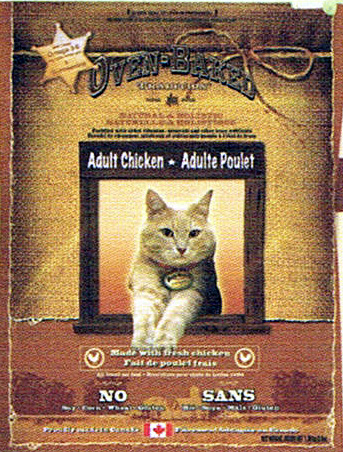 Oven-Baked Chicken cat food 2.5lb [TCCR] - HKD155 : PetPetMaMa , The Best Products for our pets! Fresh deboned chicken, chicken meal, ground pearled barley, ground brown rice, fresh chicken liver, oatmeal, chicken fat (preserved with mixed tocopherols and citric acid), dried beet pulp, pumpkin puree, brewer’s yeast, fresh whitefish, herring meal, dried egg product, ground whole flaxseed, herring oil, inulin (prebiotic), yucca schidigera extract, fresh cranberries, fresh whole blueberries, fresh whole sweet potato, fresh whole carrots, fresh whole apples, fresh spinach, DL-methionine, lecithin, dried pineapple, choline chloride, potassium chloride, taurine, green tea extract (catechin), parsley, glucosamine hydrochloride, chondroitin sulfate, lactobacillus acidophilus fermentation product, lactobacillus lactis fermentation product, lactobacillus casei fermentation product, vitamins and minerals [ferrous sulfate, zinc oxide, niacin, vitamin E supplement, folic acid, vitamin B12 supplement, copper sulfate, manganous oxide, vitamin A, selenium, thiamine mononitrate, calcium pantothenate, riboflavin supplement, pyridoxine hydrochloride, biotin, vitamin D3, vitamin K, calcium iodate], natural flavor, rosemary extract. (May contain trace amounts of peanut).